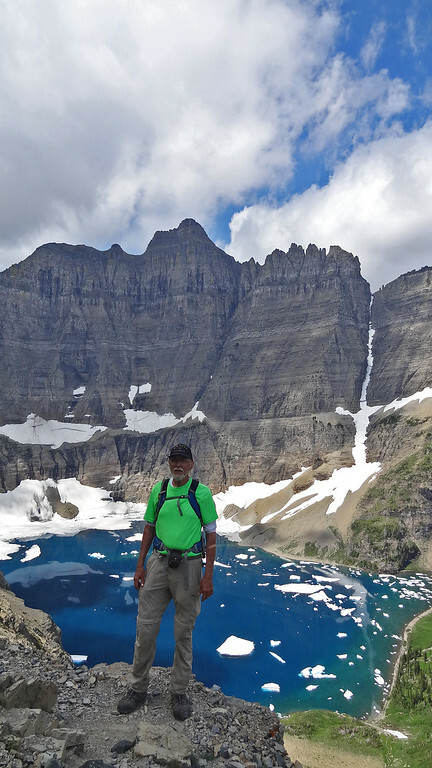 oh wow thanks so much for the photos .. gonna be interesting even trying to get to hidden lake overlook like this. Thanks for the Dragon Tail photos. I want to do that hike again sometime. Are you getting lazy or working on a beard? Planning to do the Dragon's Tail hike (for the second time) three weeks from now. Hoping most of that snow on the back side of Reynolds is gone by then! Falling on those rocks would hurt, and I'm a klutz. 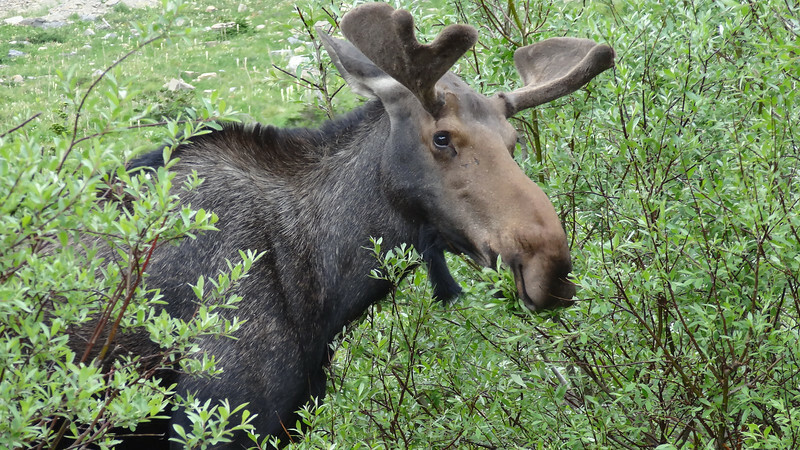 Back in early June 2017 I met a young fellow "Michael" out at Iceberg Lake. 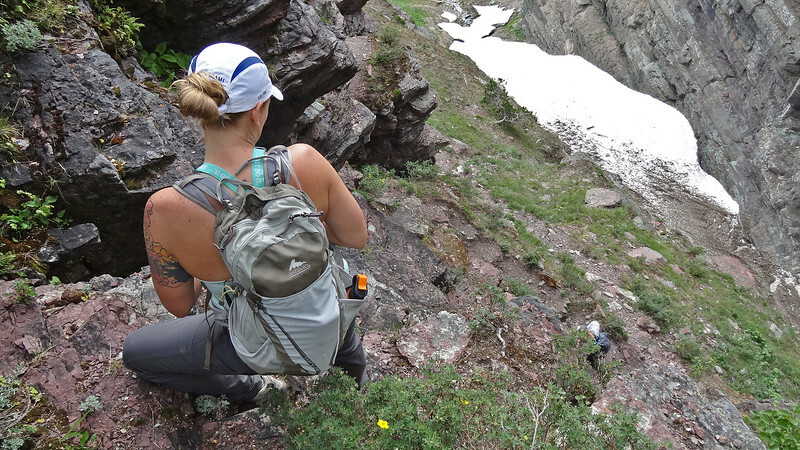 We hiked back to Swiftcurrent together. Michael was a fellow "Southerner" from southern Alabama. Apparently he had a great time during his first visit to Glacier because he kept in touch. Earlier this year he said he was coming back---and he did. This time he brought his girl friend "Ginny". Michael is a firefighter/paramedic and Ginny is a physical therapist with a PhD degree. Michael had heard me talk about the ShangriLa hike and he wanted to do it this year. I had sent him pics and video of previous ShangriLa hikes and Ginny said she wanted to try it too. Both are in great shape. Ginny completed her first Iron Man Triathalon last fall--a 2 1/2 mile swim, followed by a 112 mile bike ride, finishing with a 26.2 mile run! 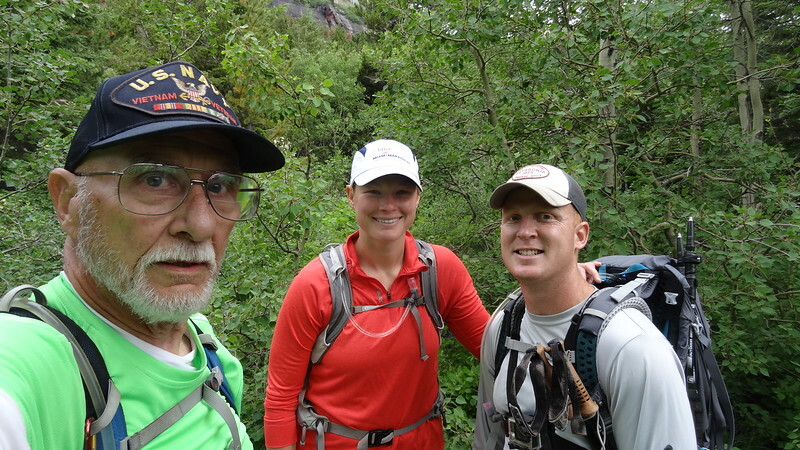 Here are a few snaps from our hike Wednesday July 25. 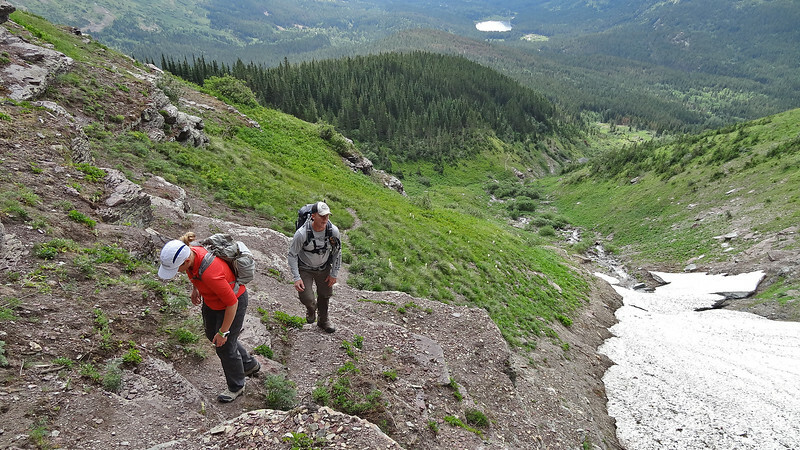 Here we are as we break off the Swiftcurrent Pass trail Into the "jungle" that begins the hike. Ginny and Michael as we approached the cliff/ledge section after climbing along side the unnamed creek. Ginny watching Michael climbing an early pitch next to the large couloir where the scrambling begins. Looking towards Crowfeet Mt just before descending to the lake. 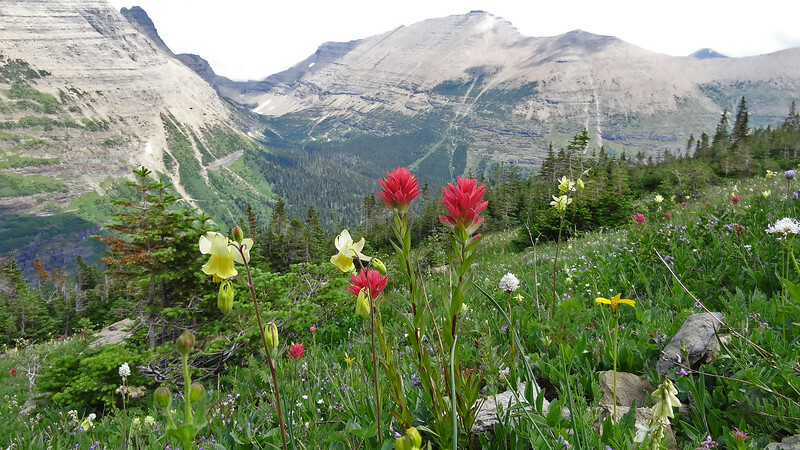 Indian paintbrush and yellow columbines. Looking ahead, Iceberg Peak and snow filled Iceberg Notch to the right of it. 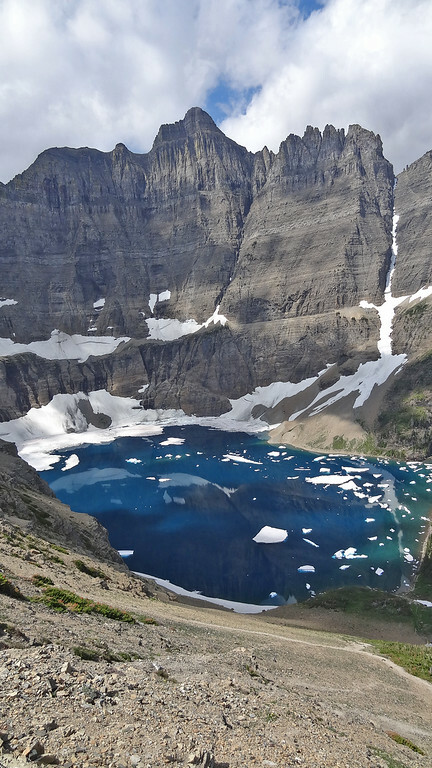 I don't believe I have ever seen Iceberg Lake this "blue" before in the 2 dozen times I've done ShangriLa. Check out the reflection of the cirque wall in the lake. There were many brave souls who waded out to this get on this "iceberg", including Ginny and Michael--not pictured here. I took pics of them with their iPhone cameras when their turn came. 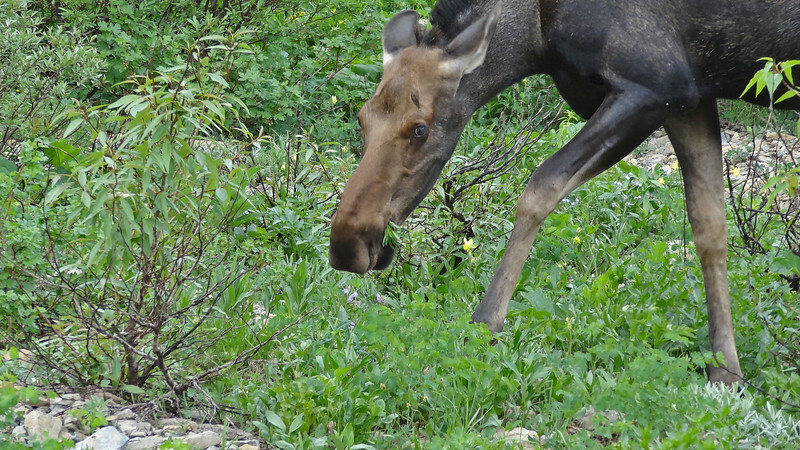 We passed this mature bull moose about a mile from the lake on the way back. He had a young two year old bull with him. 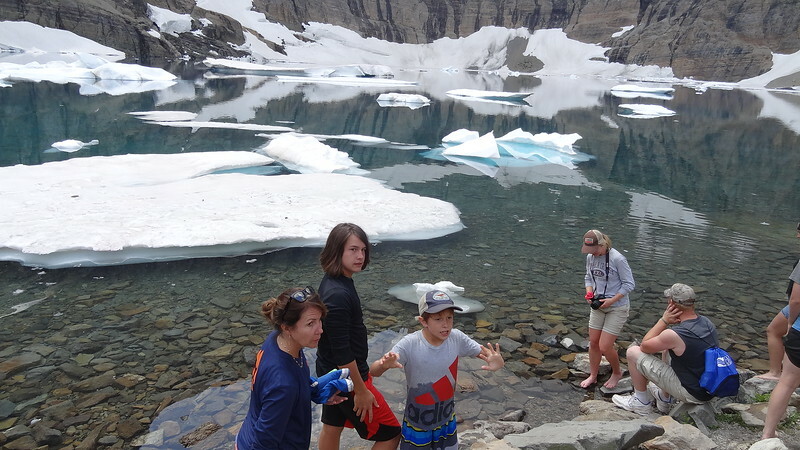 They were in this same spot 6 days before when I took a chatter friend's son on the ShangriLa/ Iceberg Lake hike. Apparently they liked the willows. Plus there was a nice big snow bank nearby to chill in after browsing. 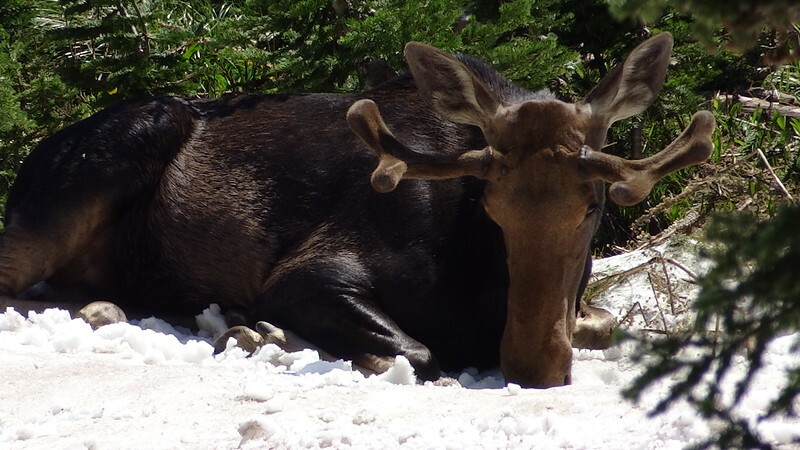 I took this picture of the mature bull chilling on the snow bank 6 days earlier. Notice how much his antlers grew in just 6 days. This was the big guy's little pal. Last edited by PeteE on Fri Jul 27, 2018 11:21 am, edited 1 time in total. I said I was and it was very flattering that he recognized me. As I've told people I've met like that, it's really fun to meet people from all over the country. Pete, Absolutely beautiful pictures. The color is amazing. Very nice photos Pete. Thanks for sharing them! Pete, excellent photos! I really enjoyed them. Thanks for posting!! I didn't take many shots, so getting a few good ones was nice. Too busy talking to Michael and Ginny. I had to work Friday so was unable to be with them. I suggested the False summit of the Dragon's Tail. Long story short, they wound up going to the True summit of the Dragon"s Tail. At some point they hooked up with some locals who led them up there. So Im really happy for them. They were Stoked!!!! Keep in mind neither of them had done anything remotely like ShangriLa, nevermind the True summit of the DT! Im in St Mary posting this. Went up on summit of Mt Oberlin again to get pics of yhe one sketchy place---the spot where you have to step across a couple feet of "air". It's not as bad as it looks. One of those mind things. Coming down, I walked over and went up to the bottom of the cliff bands of Clements. Pics and video when i get back home. Nice pics, Pete! You lucked out on the light with the color of that water! I'm surprised there's still that much snow in the gulch up there. 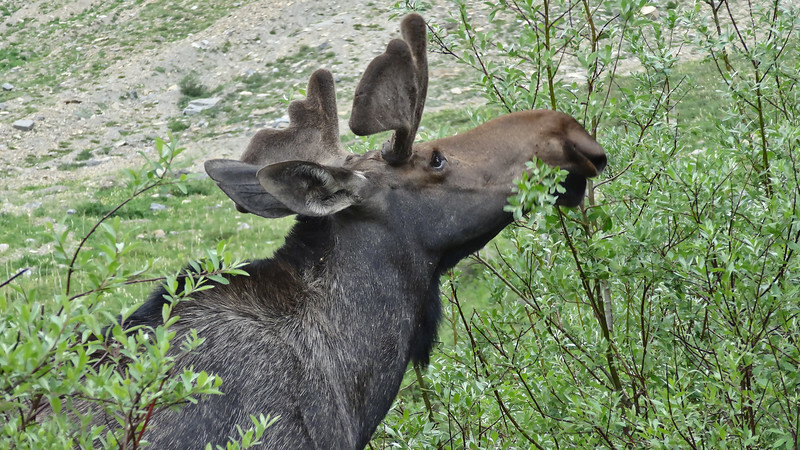 Wow you were close to the moose. Love the pics. Looks like a great hike. Enjoyed those photos very much. Thanks for posting them and look forward to your next hike. Love the shot of the Paintbrush and Columbines in the foreground! NDjason wrote: Nice pics, Pete! You lucked out on the light with the color of that water! Yeah, I really did luck out. Never seen it quite like that before. Thanks Jason for showing me the way up there the first time!! 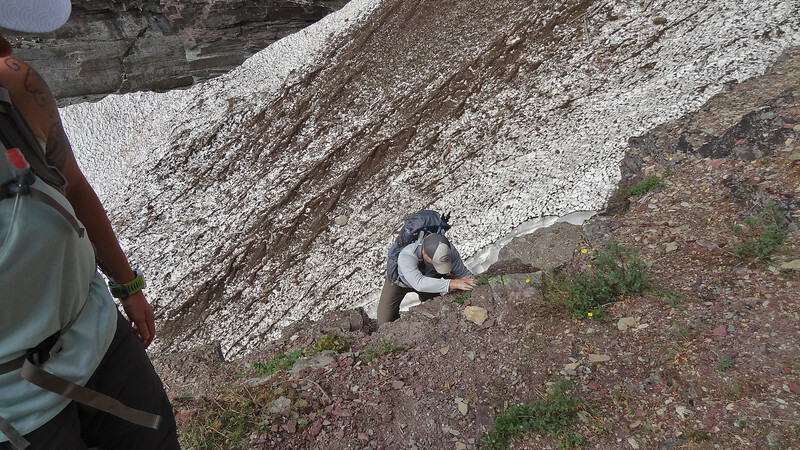 Jay w wrote: I'm surprised there's still that much snow in the gulch up there. Big snow year and that's all that's left. Been VERY sunny and hot since you left. melting a lot of snow. My friend's Taj and Carrie who are avid rafters say the Middle Fork is high for this time of year. Amazing how they had hung around that same spot for a week. You know there were literally 100's of people passing them all week. And it won't end well. llholmes1948 wrote: Looks like a great hike. Enjoyed those photos very much. Thanks for posting them and look forward to your next hike. Thanks Lyman. ShangriLa is a terrific hike for those who can do it. Great look at the lake. Along with her husband, son and his girl friend. I love meeting chatters and getting a hike in when possible. Sue was kind enough to let me tag along. I had a great time and I'll leave it to Sue to describe in her reports. ND wrote: Love the shot of the Paintbrush and Columbines in the foreground! Yeah, I love flower pictures. 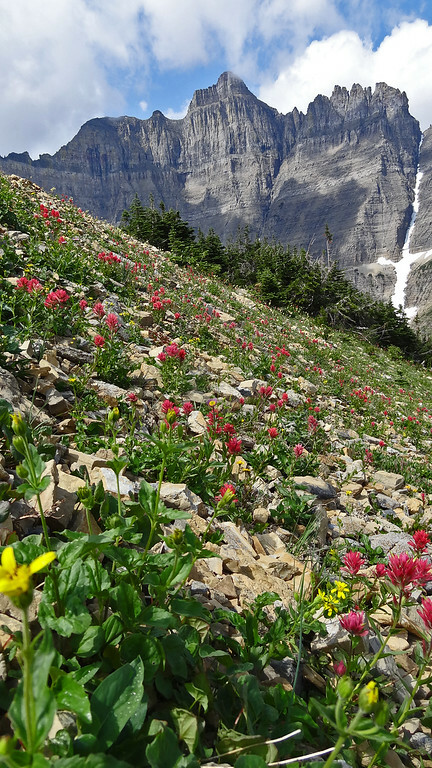 The colors in GNP's flowers just blows me away at times. Maybe it's the stark contrast between the flower's incredible color and beauty against the "poor" rocky soil they thrive in. Dunno. "which are often of an Intense blue"
Intense blue simply doesn't describe the color of these beautiful flowers. And the good news is they are fairly common in the park. Seems they are just recently beginning to bloom well in the places I've been. There's no mistaking these flowers for anything else. 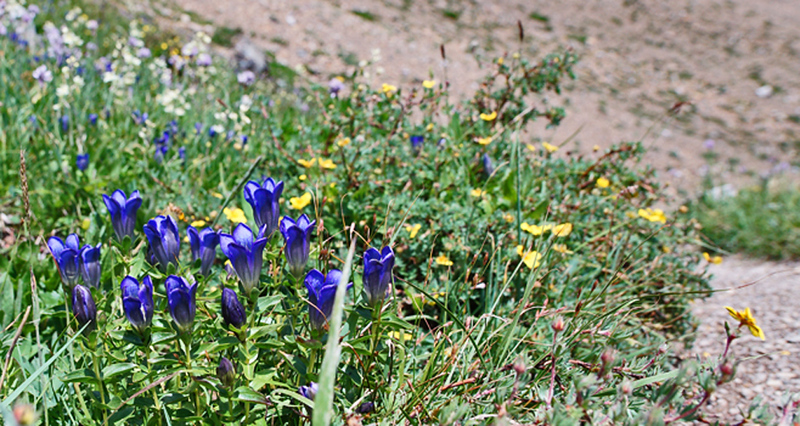 Gentiana /ˌdʒɛntʃiˈeɪnə/ is a genus of flowering plants belonging to the gentian family (Gentianaceae), the tribe Gentianeae, and the monophyletic subtribe Gentianinae. With about 400 species it is considered a large genus. They are notable for their mostly large, trumpet-shaped flowers, which are often of an intense blue. I should have some pics up later . Gotta eat. This shot was in the mid afternoon. Full, afternoon, direct sunlight couldn't totally wash out that "intense blue".